The Humpback whales here are always amazing, but occasionally a species turns up that tears you away. 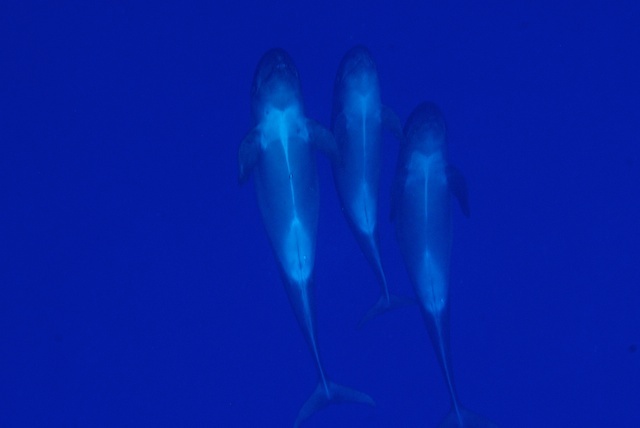 The Pseudorca is one of them, part of the dolphin family, smaller than a pilot whale, but more intensive. They as Pseudorca hunt other whales, as we got into the water, a bull that had been jumping by the side of our boat, swung back around and gave me a good ping, trying to figure out what we are. Their pings hurt, it lasted in my chest bone for over 20 minutes. The juveniles as seen in the picture above gave us a wonderful pass, showing their teeth and staying 5m below us for over a minute. Paul did a fabulous job of driving, judging the speed and getting us in the water. The guests were blown away by swimming with a different species, after so many good swims with the humpabacks in the last two days.